You never know what you'll find at a garage sale. Here are five of Aaron LaPedis' finds. NEW YORK ( TheStreet) -- Ever since I was in my early teens, I have found garage sales to be a great resource for items I can easily resell for profit. Over time, that interest has turned into a weekly obsession. I get excited every time I think about the treasures out there that are just waiting to be found. I learn something new from each purchase, and hopefully you too can learn from my best successes and biggest missteps. The following five stories depict some of my most memorable finds, both good and bad. 5. Beatles Yellow Submarine Lunchbox with Matching Thermos: My most recent exciting find was a Beatles lunchbox; and not just any Beatles lunchbox, but a Yellow Submarine lunchbox with an intact thermos. Do you remember those metal thermoses that take you right back to second grade? I swear I can almost smell the milk inside when I screw off the top. All sentimentality aside, this lunchbox was extremely valuable because it still had its original thermos. Typically collectible lunchboxes become separated from their matching thermos, thus lowering the value. When you have the thermos it can often double the value of the lunchbox. 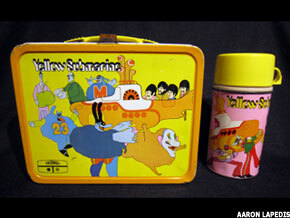 This particular lunchbox is currently selling for between $600 and $1,200 on eBay, and I only paid about $30 for it. 4. Windup Tin Toy Monkey on a Motorcycle: Number four on my list is a rather rare tin toy. While visiting a garage sale, I came across a windup, German-made, tin toy monkey on a motorcycle. The person selling the toy actually brought it back from Germany during World War II. He had recently come across the toy when cleaning out his house for the sale and decided to sell it. I knew from prior experience that it definitely had value, but when he said he wanted $45 for the toy, I replied "What is this, Sotheby's?" He laughed, and eventually I bought it for $28. When I returned home to look up the toy's actual value, I wasn't able to find it anywhere online. At the time, I decided to hold onto the toy, not knowing its true value. About a year later I sold it on eBay for $895. 3. Commemorative Elvis Doll: Fairly recently the Discovery Channel flew me out to San Francisco to show their viewers that I really can do what I say I can do with garage sale finds. While filming, I came across a highly collectible, commemorative issue Elvis doll. The doll was brand new and still in its original packaging. I bought it from the gentleman running the sale for $20. I was positive I could resell it, and after a quick check on my smart phone, I saw that the doll was worth $290 on eBay. Because of the time restrictions of the show, I chose to sell it to an antique store, making a little over $100. If time had allowed, I'm sure I could have sold it for much more online. 2. Tin Toy Ambulance: One of my learning experiences came at a time when I wasn't quite yet an expert on tin toys. I was very excited to have found a tin toy ambulance and the seller was so proud of it that I was sure I couldn't go wrong purchasing it for $65. I really felt it was a good price. When I arrived home and did a bit of research, however, I realized that the toy was either faded or had some sort of smoke damage. It was essentially a completely different color than it should have been. I realized then that because of my lack of research, my $65 purchase was only worth about $20. I have since learned that taking the time to do your research before you buy can make the difference between a great buy and a terrible one. 1. Iron Man #1 Comic Book: I discovered one of my earlier finds during my younger years. Being a teenage boy at the time, I was only interested in baseball cards and comic books. I would rummage around and buy as many comic books as I possibly could so long as they were in decent condition. On one hot Saturday, all of my searching paid off. I found the comic book of all comic books: an Iron Man #1. Even though this comic book wasn't in perfect condition, it was still in good enough condition to be worth a lot more than I paid for it, roughly 50 cents. The same comic book is now worth between $175 and $250 depending on where you look. Though I could sell this comic book for a significant profit, I decided to keep it, and it is still in my collection today. With all the years I have been visiting garage sales, I've realized that when I shoot from the hip and don't really know what I'm buying, I always seem to get burned. With that having been said, sometimes, when you've been buying and selling for a while, intuition can be your best friend. So when you're trying to become a garage sale millionaire, always be prepared for anything. Be sure to do your research, and have fun finding that next great treasure! Aaron LaPedis is a Denver-area art and collectibles dealer and the award winning author of "The Garage Sale Millionaire." For more information on his book, visit www.thegaragesalemillionaire.com or contact him at thegaragesalemillionaire@gmail.com.